Every year, our family would make a road trip out to California at Christmas so my daughter could visit with her "extended family." The visits were always fun with one exception--the weather. Whenever we were met with sunny, dry conditions, travel was fabulous. That kind of travel weather didn't happen very often. More likely we were traveling in blizzardy, icy, icky conditions. On one trip, while feeling our way through the prerequisite horizontal blizzard, I happened to say that I would like to do this some time in summer conditions. My wife lamented that it would be unlikely that she would be able to get the time off for a summer trip. But, she continued, there would be nothing stopping me and our daughter from going. Our daughter looked up from her movie to add that we should go by motorcycle! We looked at each other smiling, now there's an idea. Our little girl had just turned six years old but I didn't feel that was a problem. What I did feel would be a problem is that she had trouble staying awake on the back of a bike for more than a half an hour. So we tossed around issues of keeping her attached to me as well as carrying all the things needed for a trip of this size. Then the idea struck; a sidecar might be the way to go. For the rest of this particular trip we spent a good amount of time discussing bikes, sidecars and the items to take as well as the possible dates and times. After returning home and falling back into our regular routine, we started looking over items on hand that could be used for a summer trip. The trip would be on low or back roads so a freeway burner wouldn't be necessary which brought us to the old R-50. The R-50 was of 1966 vintage, it had been rebuilt a while back but never clocked very many miles. I had a set of sidecar gears that had never been mounted as well as an old Steib sidecar that had seen better days. I ran into some rather odd problems getting the rig together but after about a month of head-scratching, the outfit was rolled out and ready for action. 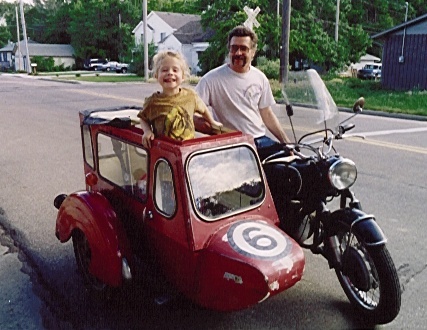 The sidecar we had bought in Holland with the intent of restoring, the "restoring" portion just never happened. The Steib's body had been heavily modified by one of its owners to suit a family with two kids. The "saloon" body addition was made of aluminum and riveted together giving it a kind of airframe look. To prepare the body for the trip, I removed the rear seat (two seats in tandem) and cut a piece of plywood to tightly fit behind passenger seat to give a large storage area. 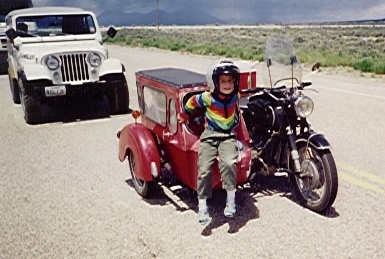 The door in the sidecar suited our 6-year old's size perfectly and she never once turned away the chance to "pop" in and out when there were inquiries from other curious motorists. Bike and sidecar together and ready to go. The days before our trip started, our daughter was issued a list of clothing she had to put together. I also gave her a plastic crate that she could put anything in that she couldn't do without. Items filled the crate to overflowing: stuffed friends (like Barney), cars, trucks (she loved cars and trucks), books and drawing supplies. I even mounted a little compass, clock and temperature gauge for her to play with. The last item for her "pod" was an intercom. The intercom not only allowed us to talk back and forth from time to time, but also gave her further incentive to keep her helmet on. We departed home on a warm May morning after saying our good-byes to my wife. My little passenger cried for some time as she didn't want to leave her mom behind. After a while I asked her if we should go back but she was determined to keep going forward hugging Barney and Brownie Stucker (her little brown bunny) for security. My intention was to go up and over Trail Ridge road except a late snow kind of put a damper on that. 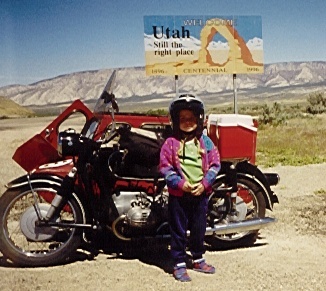 Instead, we went the long way around, up over Camron Pass (where the "Rough Roads" signs are a permanent fixture), to Rabbit Ears Pass, to Steamboat Springs. At Steamboat the sun was bright and inviting, we just had to stop and do a bit of running around before pressing on. We arrived at the little town of Maybell at about 4:30 in the afternoon. Seems the city park in the middle of town plays double duty as the public campground as well. With the tent pitched and dinner out of the way, we toted the dirty dishes to the men's showers to wash up. Strange the things that excite little kids, she talked about using the men's showers for the rest of the trip! Going to sleep this first night took a really long time, I told varying versions of "The Three Bears" several times before she finally fell to sleep. Next morning I woke at about 5:30 to find her rolled up in a ball down in the bottom of her sleeping bag. When she started to stir, she tunnelled to the top of her bag with a musical "Good Morning." Next words were "I'm cold!" I left her to get dressed in her sleeping bag while I started cooking breakfast. While we were sitting wrapped up in a space blanket eating breakfast, a humming bird dropped down and zipped between her breakfast and her face--giving her quite a start. Any closer and it may have zipped right into her mouth! The next leg of our trip took us to Dinosaur Nat'l Park. The Visitor's Center didn't have any bones but we had to stop anyway. No sooner had we stopped we were accosted by flies. The flies weren't interested in us, they were interested in the splattered bugs on the sidecar. My daughter was bored by the visitor center (big surprise) but was absolutely mezmorized by the stuffed bald eagle inside the door. The dinosaur quarry was a different kettle of fish; I thought we would never get out. There were bones everywhere of every kind of dinosaur. My dinosaur fanatic got so wound up she began seeing bones that weren't even there. When she finally ran out of steam, we had a lunch of peanut butter and jelly then headed back out to the road. My daughter with dinosaurs looming in the background. The road towards Provo, Utah had a lot of road construction, so running at the construction speeds was no problem. The drivers here were both low on the ability scale as well as being rude to make up for it. They were in such a hurry to save a few seconds at any cost that they would pass us on blind turns across double lines. After completing the pass, they would ever so politely stick their arm out the window and flash us the middle finger salute! We stopped in Provo at a Chevron station to see if they had any Techron or "eyeball" cars (as my little passenger called them). At the station we were confronted by a small group of early teen girls who were loud and irritating. My daughter was interested in their foolishness to begin with but soon tired of them. Because the road we were riding on didn't go through, we had to jump on to I-15 for a bit. I didn't like this part as the traffic was moving at a very fast pace. I slowly caught up to a truck hauling an oversize load and just stayed behind it until our exit appeared. Once on Route 6, the traffic all disappeared giving the feel of a ghost highway. There were some campgrounds along the way but they were all closed because of late snows. Up the road a piece was Sahara Recreation Area, no sooner had we turned in and we were being eaten alive by mosquitoes! On we pressed. By the time we arrived at Delta the sun was going down and we were out of options, so we had to take a motel room. To say the motel was a flea bag isn't a very nice thing to say, so I'll just say it was an older motel with no hot water, a cheap facelift and a leaky roof. I had to empty out the sidecar as the local teens found it way too interesting. The next morning the "old boys' club" was in session at the cafe. Wheather seated at the counter or outside in the smoking section they were all just alike. With the prerequisite ball cap, beer belly and untucked shirt, all had an opinion to share. From politics to lady's shoes, you'd be sure to find the answer to your most curious questions right there. After eating, we left the slow service behind with the "old boys' club" still in session. Sidecar loaded up, we set out for points West. Just inside Nevada we stopped to visit Lehman cave. We had to hang around for a half an hour before our tour was to leave but that's ok--six-year-olds really like to visit souvenir shops. When the tour started, we were real close to the front. My daughter wanted to take so many pictures that we ended up at the rear. At one point we got separated from the group, this is when we met Serina. Serina was in training as a tour guide. This being her first job, it was her responsibility to watch for stragglers (in this case, us). My daughter took to Serina like she was a long lost sister, holding her hand, hugging her and even telling her the deepest secrets (good thing at six years old her secrets aren't real deep). After the tour she wanted to hang out with Serina but Serina had to go back to work and we had to be on our way. We could have bought gas at Baker, instead, I opted to run out of gas twenty miles short of Ely! My fault, I misjudged the headwinds. Actually I thought we were suffering a break down. When the engine started to sputter, I switched the fuel valve over to reserve with no effect. As luck would have it, we had just crossed over a summit and it was all downhill. While we were coasting downhill, I had to explain to one very afraid girl that we just had to figure out what was wrong and what to do about it. The downhill slowly came to an end in a "Prison Zone" so hitch hiking was out of the question. As my mind went over possible things that may be wrong, this shaky little voice came over the intercom asking, "Are we going to die here?" Her question was so unexpected that it was all I could do to stop myself from laughing. A big hug and some re-assuring words brought a smile to her face. Discovering our mechanical problem was the fuel valve brought a smile to my face. Lucily I had thought to carry an extra gallon of gas in a jug on my back rack. Fuel added, we were again under way. We found the city park right where the "welcome wagon" said it was. The grass was kind of overgrown but seemed like we could still make a go of it. Just as I shut down the motor, the town policeman showed up. He said it would be fine for us to stay there but the water haden't been turned on yet. No water, no bathrooms, we blew it off and checked into yet another motel. Next morning, we had Belgian waffles! My daughter opted to have waffles with her syrup (yes I said that right). Before leaving Ely, she wanted to walk around town. On our walk, she fell in love with an old building, the "Sentinel Building." She took several photos of it as well as made a drawing. 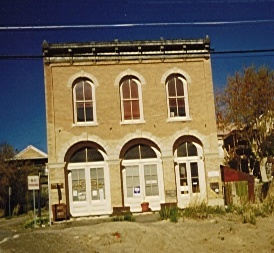 The Sentinel Building, Ely Utah. In Austin we stopped at yet another Chevron station in search of "eyeball" cars. While we were stopped at the station, a streetcleaner passed by spraying down the road with water. The station attendant expressed her disgust for the streetcleaner's efforts by yelling at it as it cruised by. When a big truck drifted by it became obvious what she was yelling about--the plumes of dust came down on all of us. On the road again, the green-covered hills slowly turned to patchy scrub brush as we aproached the Alkali flats outside Fallon. The dust devils in the distance prepared me for more headwinds. While my passenger played with her Beenie Babies, I took in the sights. Not far into the flats all the traffic (all four of us) were brought to a halt. A large semi-load of hay had caught fire and there was emergency equipment totally blocking the road. After sitting in line for close to an hour, the police started snaking us past the problem. It felt good to be rolling again. We rode up and down the main road in Fallon looking for the campground. I found out later that the campground only had one tent site and it was taken. Shaking my head in disgust, we decided to press on to Reno. The traffic on the road between Fallon and Reno was so scary that I opted to get on the freeway (I-80) to Reno. Once in Reno, again, no open campgrounds. Unbelievable, when do they all open? Another motel. After settling into the motel, it was time to call home to let my wife know where we were. Picked up the phone, dead. Went down to the office, dead there too. Tried a phone booth down the block, dead! I flagged down a policeman to ask what the deal was and he informed me that there was some kind of problem at the local substation. Back at the motel, we called it a night only to be woke up at eleven o'clock with a phonecall from a worried relative. Seems she had been calling all the motels in the area after the phones were back on line. Knowing the phones were back up, a quick call to a very worried mom needed to be made. Next morning found us laboring up and over Donner pass. Sun turned to clouds, clouds turned to rain, rain turned to snow. I needed to stop several times to put on more and more clothes. As we rolled over the summit of the pass, I was losing the feeling in my hands. My worries were for my daughter, I didn't want her to get too cold. Looking over to her eased those worries, she was all bundled up and singing at the top of her lungs! When she saw me looking at her, she started making faces at me and laughing. Our destination that day was Auntie Elly's house in Auburn. We found the house easily enough but I had trouble getting off the bike and spent the rest of the day trying to warm up. The visit with Auntie Elly took a bit of a turn when I discovered the rear tire on the bike needed replacement, good thing we had planned to be there for a few days. I found a local shop that sold me a cheap tire and Auntie Elly and I struggled it on. Next stop was Oma's house in Magalia. The trip to Oma's house was fairly boring over straight little roads under sunny, hot skies. As we approached Chico, clouds had started to form and the air was cooling off. On the outskirts of Magalia we were again in rain. Oma's garage was a welcome sight. The valves on the little bike were getting noisy so once we were out of the weather, a little service work was carried out. What a disapointment, it rained almost every day. We all got so bored that we actually rented a T.V. from a furniture store in Chico so we could watch a bunch of movies. I was worried that my daughter would remember how much it rained, instead, she only remembers how much time she got to spend with Oma. Again I find I never needed to worry. This next part of the trip was going to be different, only in that Oma was going to come as well. No, not on the bike, she was going to follow us in her car. Our destination, Jupiter, just outside Twain Harte (just outside Sonora). We got going earlier than Oma as our mode of travel was kind of slow. Oma would follow about a half an hour later. Funny how things work out (or in our case, don't work out), when we had pulled off for a gas stop and munchy break, Oma didn't see us and sailed on by. Our next stop was in Lincoln, we didn't plan on stopping there, the bike made the decision for us. As we rolled into Lincoln, the bike sputtered and died. Good thing, no. Lucky thing, yes. When we rolled to a stop, we were right in front of an auto parts store. By now, this breaking-down drill didn't bother my daughter at all. She just got out onto the sidewalk, opened a soda pop and just kind of danced around expecting me to cure the problem. Going down my breakdown list, check the gas, check the spark, wait, no spark. Pulled off the front cover, as the cover came off two nuts and washers fell out. Seems the nuts holding on the magneto fell off allowing the timing to drift. The repair was easy: slip the magneto back into place, eyeball it's location, tighten it up and we were back on the road. As we got back under way, Oma had figured out that she passed us and came back looking. 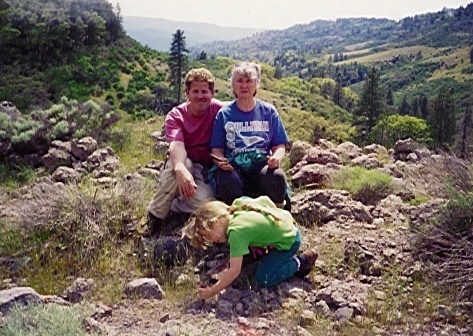 The rest of the trip to Twain Harte, we never got out of Oma's sight. The road sign to Twain Harte didn't seem real clear to me, so I made a wrong turn. Oma had been there before so she put me back on the right track. In Twain Harte we stopped again for some munchies. This gave me time to review the directions to Jupiter, yup, still had ten miles of dirt road to go. The dirt road into Jupiter is like most dirt roads, mostly single lane with chuck holes, ruts and washboard. On a motorcycle with sidecar I like to go briskly on dirt roads, enjoying a good three-wheel slide while rounding corners makes it all worth while. What I didn't know was there were some very large trucks also using this road to move cattle. We never came to grief but did have to move totally off the road to let two of these very large trucks go by. After that little incident, I calmed down and rode at a more reasonable level. We arrived at Auntie Marsha's place in Jupiter just before night fall. Next day we were wisked off to Columbia to see "Tent Town." Columbia is a semi-restored ghost town. Every year Columbia hosts a an affair called Tent Town to educate kids (as well as grownups) on what towns were like in the Gold Rush days. 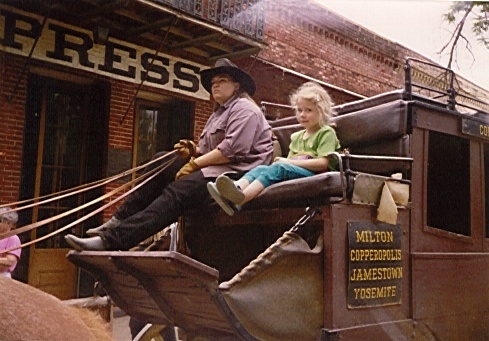 There wasn't much my daughter didn't experience in Tent Town, from gold panning to being robbed on the stage coach. The remainder of our time in Jupiter was a little more relaxing punctuated with wading in the creek, playing with the animals, scouring the old railroad grade for metal relics and digging for obsidian. She even got to see what it was like to float through a water-filled cave on a blow-up mattress! All too soon it was time to head for home. Riding the stage coach in Columbia. Looking for metal pieces on the grade. All the sunny, warm weather we had during our visit, it only stands to reason that the morning we were to leave would be raining. Rain gear on, top of the sidecar buttoned up, we were off. For the return trip, instead of going I-80, Sonora Pass was chosen. Little did I know of the steep, winding road that lay ahead. We did make it through but the poor little R-50 really had to work hard. I expected the curves and switch-backs, it's the 27% grades that caught me off guard. To make it over one of the steeper grades I had to jump off the bike and run beside and it still had trouble! 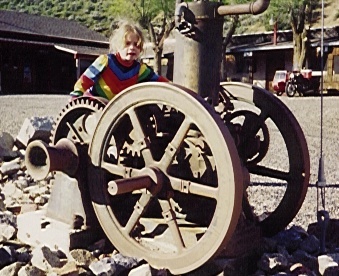 Carefully inspecting a relic of the gold rush. Once clear of Sonora Pass, the only things that stood between us and home was lots of road and lots of road construction. I don't think my gregarious passsenger felt at all negative about road construction, she just looked at it as another way of socializing on the road. 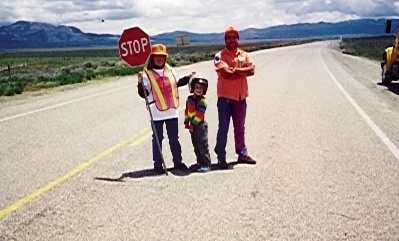 We often got stopped at or near the front of the line of cars, and she would then express her desire to get out and socialize with the flaggers. I think the flaggers liked it too as it was a welcome change from the usual grumpy, cussing car drivers. Waiting in line, road construction. We stayed on Hwy 50 most of the way home and, yes, we mostly moteled it (as it rained for a good portion of the way home). On the return trip only one small incident occured. In Utah, where Hwy 50 and I-15 meet, there was a small, dirtbag of a Conoco station. I could see there was another shiny-new gas station up ahead, but no, I had to stop at the one that looked like it could use some business. After we tanked up, we both had to use the restroom. All through the trip my daughter had used the "men's" so she expected to use this one as well. To say the men's room was dirty would be a gross understatment, even the toilet had been used several times without flushing. I told her not to touch anything as I leaned over to flush the toilet. Just as I was about to touch the flush handle, there was a ker-ploop sound. The communicator clipped to my belt fell into the toilet! Without a thought, I thrust my hand into the heavily used water and whipped the communicator out and tossed it into the sink. Cranked on the fawcet to wash both my hands and the comunicator,... no water. No hot water, no cold water, no paper (towels or otherwise), nothing but filth. Out of desperation, I grabbed the communicator, jumped out of the men's and burst into the women's. To both of our amazment, the women's was clean, had both hot and cold running water, a working toilet and all the paper you could ever want! Without hesitation, we both washed, used the facilities, dipped the communicator and got back on the road. I must be easy to impress, the fact that the communicator had been completely submerged twice and kept working surprised the heck out of me. Seems like the closer we got to home, the more interested my daughter was in getting there. Finding out Trail Ridge Road was now open, that's the way I decided to return. I explained just how close to home we were but no matter what the sight, be it elk, lakes or the height of Trail Ridge itself, the only response I could get was "Mommy, Mommy, Mommy!" We had to fuel up in Estes Park before cruising down the hill to home. At the gas stop I actually had to force her to eat part of a sandwhich and drink some soda, she just kept repeating, "let's go home, let's go home!" Knowing we weren't far away I gave in, put the sandwhich away and downed the rest of the soda. We were home in less than an hour. 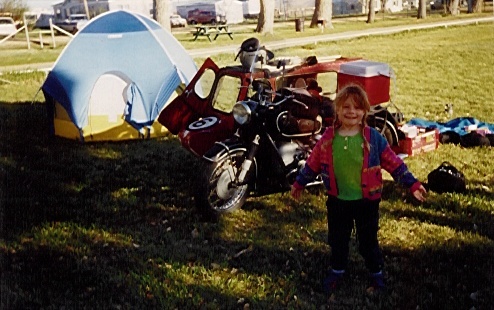 When she exploded out of the sidecar jumping and squealing, I thought she might knock her mom to the ground in her excitment. The next few days were spent getting back to normal. 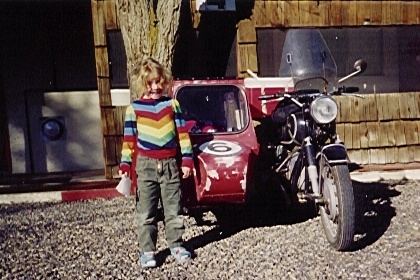 I don't suppose any more than a week had passed before my daughter was asking when we were going to take another trip in the sidecar!